Updated with a 20% bigger design, the Big Mesh Mummy Backpack is the perfect choice for hauling swim and workout gear. The LBMMB3 features a spacious main compartment for storage and mesh venting for increased dry time and drainage. Over the shoulder straps allow for easy transport, while barrel-lock closures provide quick and easy access to your gear. It's a really good size for a kid and or an adult. 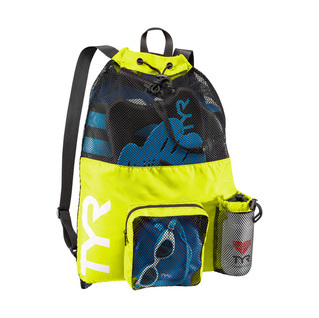 I've purchased this bag in another color from another swim company so I knew what to expect. However, the orange is by far my favorite as well as my daughter's whose club swim team is orange and black. Great bag that holds all of her swimming gear, which she uses for swim practice everyday...kickboard, pull buoy, fins, snorkel, hand paddles, goggles, swim cap, and water bottle. 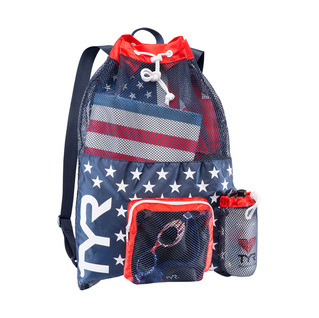 This little backpack allows you to place all poolside swim items needed for competition with the mesh design to help with drying and considerable less odor than duffle bags.. 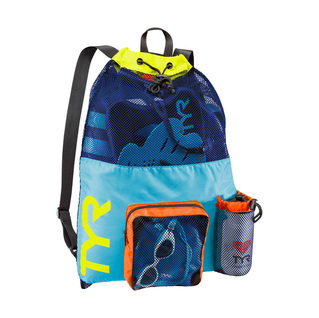 I purchased this backpack style swim bag for my 13 year old daughter. 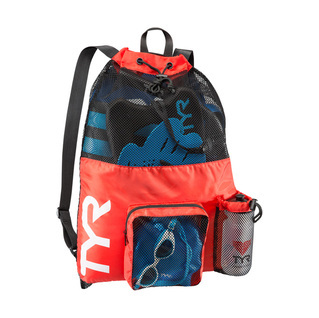 Although we just starting to use it for practice swim sessions, it is holding up great. All the kids have this brand and type and I am so happy that I found it for an awesome price! they are working out fine. The mesh product has outside pockets which are very helpful. It easly holds all of my daughters swim accessories, and can be worn on back as to have hands available to hold other items. 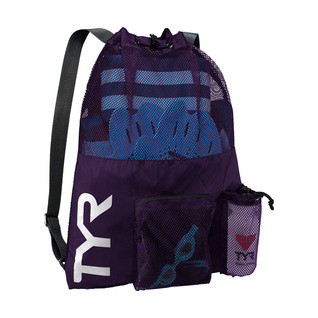 More of a simple bag than a backpack; kind of shapeless and floppy, but will do the job. Bags are slightly larger than expected but will serve the purpose for which I purchased them. Very happy with my purchase. A few more zippered pockets would be nice. Very happy with the size and quality of this backpack. 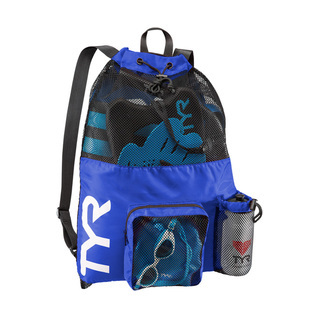 Great for all of the wet swim gear that sits on pool deck. Plenty of ventilation to let it all dry without having to unpack it every night. I wish that there was a large pocket insid ethat could hold my paddles in place. Because there is only a large bag, certain things move around inside the bag. I get jabbed all the time by paddles and water bottle as i am walking. I have to stop a rearrange items about every block. The bags were larger than I expected and very roomy. Good quality. Well made and hopefully will last a long time. Just what my daughter was looking for!!! It seems to do the job!